Is agriculture good for your health? 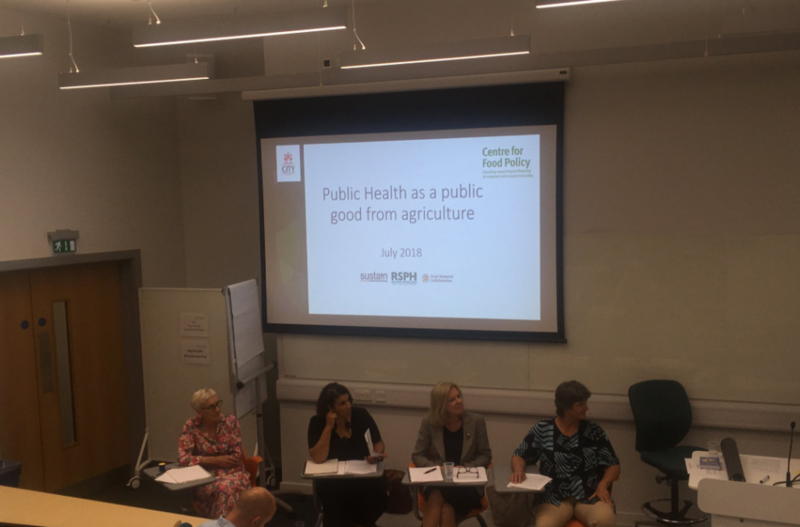 On 11 July, with Sustain and the Royal Society for Public Health, we held a seminar on the thorny question of whether public health can or should count as a ‘public good’ from agriculture. It turned out to be a well-attended and (as one participant observed) carefully choreographed event. We ran it as a kind of ‘inquiry’ with a panel of expert investigators, expert witnesses, a hard-working facilitator, and lots of opportunity for audience participation. The trigger was the widely noticed dearth of references to human health in the Government’s agricultural policy outline Health and Harmony (despite the title).This document proposes that any public funding for agriculture that replaces the CAP must support ‘public goods’, such as environmental protection and landscape conservation. Sounds fine – except that the term ‘public goods’ has a very narrow meaning in economics, which (as the seminar heard) doesn’t easily accommodate health, with public health a contested area and agricultural public goods still off the radar. We took these points on board. 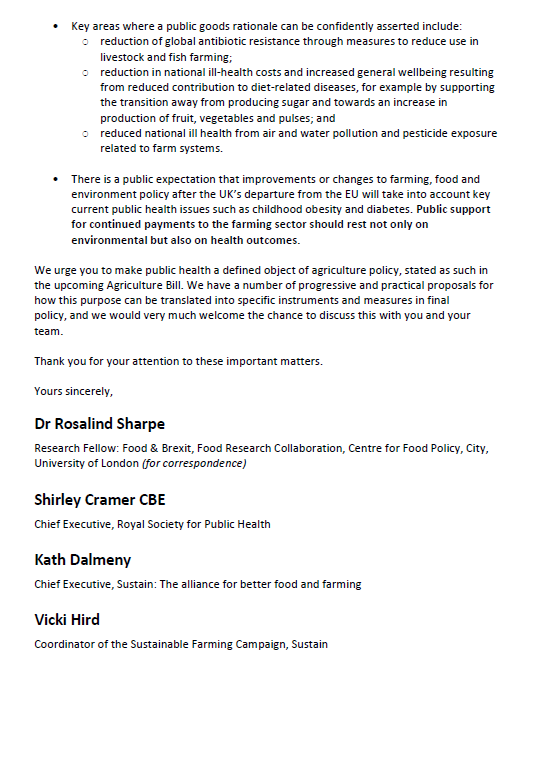 However, there was agreement that agricultural policy has enormous potential either to support or undermine public health, with significant related benefits or costs to human well-being and the economy. Examples included the heavy use of antibiotics on farms, leading to resistant bacteria; the polluting and health-damaging effects of pesticide use; and the use of land to grow sugar rather than healthier vegetables or pulses. There was therefore strong support for the idea that health should be explicitly recognised in the forthcoming Agriculture Bill as a purpose and output of agricultural policy. 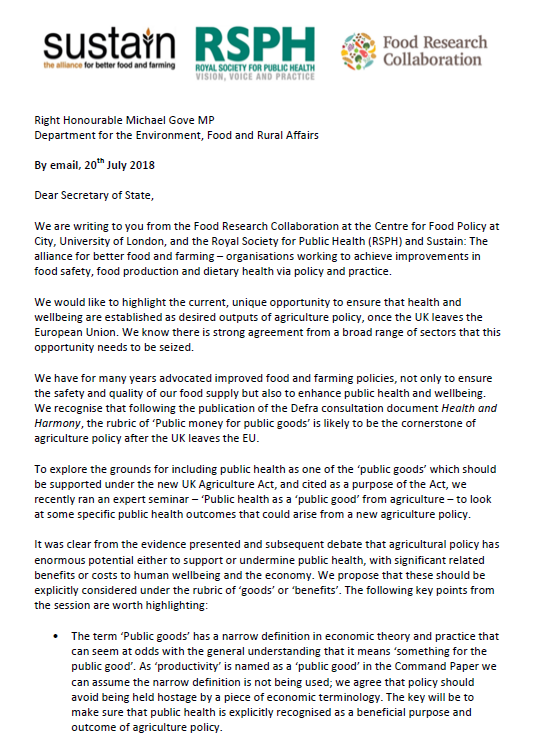 On this basis, we put together a letter to the Prime Minister, the Secretary of State at Defra and other senior ministers, making the case for this to be included in the Bill. We will produce a more detailed Briefing based on the seminar in the autumn.